Arlington, VA, May 31, 2018 – As children head out of school, PBS KIDS aims to address the summer learning gap by encouraging kids, parents and educators to engage in adventures to make the season one of creativity, learning and fun. 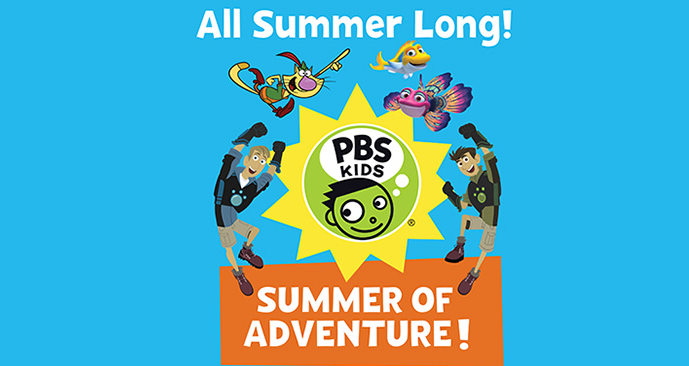 Fans of PBS KIDS will get a chance to see new episodes beginning June 6, including READY JET GO!, the first-ever WILD KRATTS marathon and new specials from NATURE CAT and SPLASH AND BUBBLES, exploring themes such as the natural world and ocean animals’ migratory patterns. New episodes will premiere on PBS stations (check local listings) and will be available on pbskids.org, the free PBS KIDS Video App and the PBS KIDS 24/7 channel and live stream. Images and additional programming information are available on the PBS PressRoom. While Aviva and Koki help two Wild Kratt kids make a catapult, Chris and Martin explore the world of grasshoppers. They soon realize that these mighty jumpers were really the first catapulters, and the Kratt Brothers set off on a creature adventure to learn everything they can about the grasshopper’s amazing jumping powers. The Tortuga is traveling down a dirt road when Martin spots something blue in the sky. It’s a blue heron! – one of the largest birds in North America and the largest heron. Even though the bird is blue – and not green as Chris was hoping – Chris realizes that it doesn’t matter. It’s not the color of the creature, but the power within. And soon the Wild Kratts are off to discover the blue heron’s amazing abilities. Aviva challenges Martin and Chris to a fencing duel and tells them to choose their swords. The bros can't decide, so she tells them if they pick their favorite billfish – swordfish, marlin or sailfish – she’ll make them a Creature Power Suit. So they head out on a mission to explore the mysterious world of billfish. While Koki is monitoring her daily “villain watch,” she discovers that Gourmand is heading to the island of Komodo. The name sounds familiar, but she can’t recall why, so she asks the Kratt Brothers, who do a double take. The island only has the world’s largest lizard – the Komodo dragon! They decide they’d better go and see what Gourmand is up to on the island of these amazing creatures. The Jim Henson Company has remained an established leader in family entertainment for over 60 years and is recognized worldwide as an innovator in puppetry, animatronics and digital animation. Best known as creators of the world-famous Muppets, Henson has received over 50 Emmy Awards and nine Grammy Awards. Recent credits include Julie’sGreenroom (Netflix), Dot. (Sprout/Hulu), Splashand Bubbles (PBS), Word Party (Netflix), Doozers (Hulu/ Sprout), and the Emmy®-nominated Sid the Science Kid (PBS), Dinosaur Train (PBS), and Pajanimals (Sprout). Television productions include Fraggle Rock, The Storyteller and the sci-fi cult series Farscape. Features include Disney’s Alexander and the Terrible, Horrible, No Good, Very Bad Day, as well as The Dark Crystal, Labyrinth, MirrorMask, and Jim Henson’s Turkey Hollow. The Company is currently in production on the upcoming Netflix original series The Dark Crystal: Age of Resistance. Projects in development include the highly anticipated film Fraggle Rock.